Since it is Monday, I thought it would be appropriate to give you some Monday inspiration! Usually I'm not really a Monday person but since today is my birthday, this Sparkle All Day sentiment from So Suzy Stamps is pretty true! I wanted to use Nuvo drops in a way that they were the main focus on my card. I use Nuvo drops on nearly all cards these days so I thought I would try to create an image with them. It's not perfect but it looks pretty cool to me! I am also giving away a $25 gift certificate to So Suzy Stamps below! All Nuvo drops colours can be seen here! The stencil I listed below is not the stencil used in the video (it is retired) however, it is similar. PS. I've done pretty much everything with the rafflecopter, but not sure if you can see my stuff when I log out...don't like staying logged in...Fingers crossed I'm doing it right! Happy Birthday Justine ! I hope it's wonderful you day and others spoil you rotten 😘😘😘😘😘😘😘 ! Great idea! Love it. Happy birthday. Love that pretty butterfly and the sentiment! Happy Birthday to you... I hope your day is extra special! I am from northern CA. I love the way the butterfly turned out. I never thought of doing something like this but really pretty. Hope you have a Happy Birthday! Thank you for all your wonderful tutorials. I love watching them for ideas. I have a lot of the original Nuvo drops & am finding that some work better than others, making a nice round drop. I haven't removed & cleaned the dropper part but I'm hoping that will fix it? Have you had any issues with yours & if you did were you able to fix them? The only issue I have had is that time to time they clog. I run them under hot water and use a needle to poke through the tip. That works for me quite well. HAPPY BIRTHDAY 🎉🎊. 🌈 What a Gorgeous card you created....your Nuevo drops technique is very clever and makes for a beautiful butterfly!! Thanks for sharing your creative ideas they definitely spread that Craftabulous inspiration!! May your day be filed with all that is total Fabulosity!! May all your wishes come true!! Thanks for a chance for a very generous giveaway!! You so ROCK!! Happy Birthday! Lovely card and I love the sentiment. Happy Birthday! I love the card and the new ideas. Super duper happy birthday, Justine! You're so talented! ^-^ I loved the idea of using a stencil to give you a guide on where to place the drops. Such a fun idea! Thank you!! Enjoy your day! I am from Canada, southwestern Ontario more specifically. Happy Birthday Justine! Your card is gorgeous, I love the Novo drops used this way, I never would of thought to do this but it really looks incredible. Thank you for the great video and inspiration!!! What a great idea to use for a stencil - love it! And that sentiment is Great! I'm from the great state of Maine in the US. That is just genius! Thanks for the tip on avoiding Nuevo peaks. ;) Headed home to try it out. I'm so glad you shared this technique today, Justine! I walk by the display of Nuvo Drops at my local scrapbook store all the time and I've only ever bought two, white and transparent. I wasn't sure what colors I would need so I never bought any others! Now I have this idea as well as a few others dancing around in my brain...yay! Happy Birthday, and thanks again! Btw, I can't seem to get my Google account to come up here so I always have to sign "anonymous." I don't know if this takes me out of the running for your give-aways but I hope not! Love card . Willl try making a card using Nuvo drops . Thank you for sharing all kinds of techniques for our inspiration! Have a wonderful, glittery, sparkly birthday. Love your card. Creative use of Nuvo drops & stencils. Wishing you a glittery fantastic birthday! Great idea for stretching Nuvo drops. Happy Birthday! Being from New Jersey, I always appreciate anything that brightens my day! Your beautiful card did just the trick, thank you! Happy Birthday Justine! I hope you have a sparkly day!! Great tips using the Nuvo drops. Love the idea of using stencil with the Nuvo drops. I love how you think outside the box. Happy Birthday Hope it was a beautiful day, it sure was here in PA cute Card. Happy birthday! Thanks so much for sharing your talents with us! Happy Birthday from Rockford, MI. Happy Birthday Justine! I have two bottles of Nuvo Drops, but now I need more! I live in Wisconsin but half of my genes are from Finland. Ever been to Finland? Your card is really cool; love it. And...I am from So. Florida, born & raised. I only have 2 colors, so far. This is so awesome. Happy Birthday from Washington state! Hope you have a wonderful day. Your card is so pretty. I am from north Missouri, USA!! Hope you had a wonderful birthday! Happy Birthday! Adorable card and love the idea of using a stencil. I am from Manteca, CA 45 minutes from Sacramento. From Texas! I love the Nuvo butterfly! Thanks! Happy Birthday! Love the way you used the stencil and colors are adorable! what a GREAT idea Love how it came out. I would have started on the left because I would be sticking my hand/arm in the right side the whole time. Thank Justine! You make using the Nuvo drops look so easy :) I have not purchased them yet, but now I know I'll have to! Your card turned out great! I've always wanted to own some Nuvo drops! It's great idea to try this way. Thank you for sharing! I've been eyeing these Nuvo drops and this is a great excuse to invest. Beautiful!! That is so blingin' awesome!!! What a great idea! You totally have a much steadier hand than I though! Lol Happy Birthday!!!!! I'm from Virginia. Can't wait to try this technique. Happy Belated Birthday. Your butterfly is gorgeous. Happy Belated Birthday, Justine! I hope you found much JOY in your special day! :) Thank you for this wonderful card technique using stencils and craft supplies in a new way! I live in BC, Canada! Thanks for all that you do! Happy birthday! You have a wonderful talent and a remarkably steady hand! I want to try playing with Nuvos! They look fun!! Hope you had a wonderful birthday! Love the use of the Nuvo drops on this card. Gorgeous! Im originally from Canada...now living in the US. Butterfly.Very inspiring.And I need inspiration.lol Thank You for giveaway opportunity! Hope you had an amazing birthday (and are still sparking today). Love how you used the Nuvo drops in a new way. There is certainly enough liquid in there to be put to good use! The butterfly is gorgeous. Such a cool and innovative idea! I hail from Central Wisconsin! I am from North Charleston, SC. I love Nuevo drops and use them quite often. I will have to say that I have never made an image like that though that was cool. This is beautiful. I love Nuvo drops too and once used them to color in a wreath that I stamped. I'm from India, currently living in Kansas, USA. I may have to break down & buy, yet another, new product! Especially with another new way to use all those stencils I HAD to have! Great card! I love this card. Such a fun way to extend your supplies further! This card design is so pretty! I love these Nuvo Drops and your technique! Great idea! This card is so beautiful, thanks for sharing. What a neat idea! I still need to practice not getting peaks on my drops. This is a great idea to use Nuvo drops. Belated Happy Birthday as well. Happy Birthday! Love this technique and new way to use Nuvo drops! I'm in Texas but also love traveling too, especially internationally! I love everything Butterfly! I have yet to try the Nuvo drops and this will be the perfect project to try them! Great video. I'm from South Dakota!! Awww!!! Such adoble card and funny sentiment!!! I'm from Italy. I was born in Sicily but now I live in Tuscany. I love so much travelling too!!! Happy belated birthday from Virginia USA. Lovely card. I have not tried these.....yet. Happy Birthday to you!! Love your awesome card! I need to get some drops, I can see! Gorgeous! I live in sunny Nebraska but am originally form WA state. I'm from India, living in the US now. And these drops are magical...need to get this! Lovely card! I am from Czech Republic, but now I live in Germany. I have not tried the Nuvo drops but I really need to get some! I'm originally from Guam but live in California now. Happy Belated Birthday Justine! Love this card - What a cool way to use the Nuvo drops - I never would have thought of this! I have just used these Nuvo drops lately and really like them. I'm from Illinois! I love the way you used the Nuvo drops! 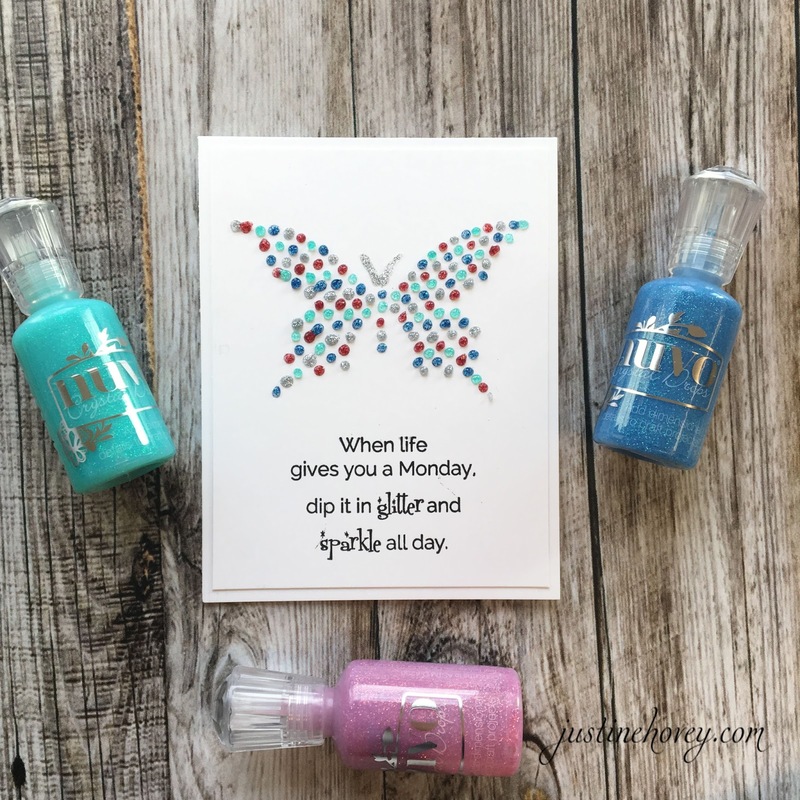 A different way to use Nuvo drops and it inspires to try different things in crafting! I am from San Francisco Bay Area in California! I'm from Pennsylvania, suburb of Philadelphia.